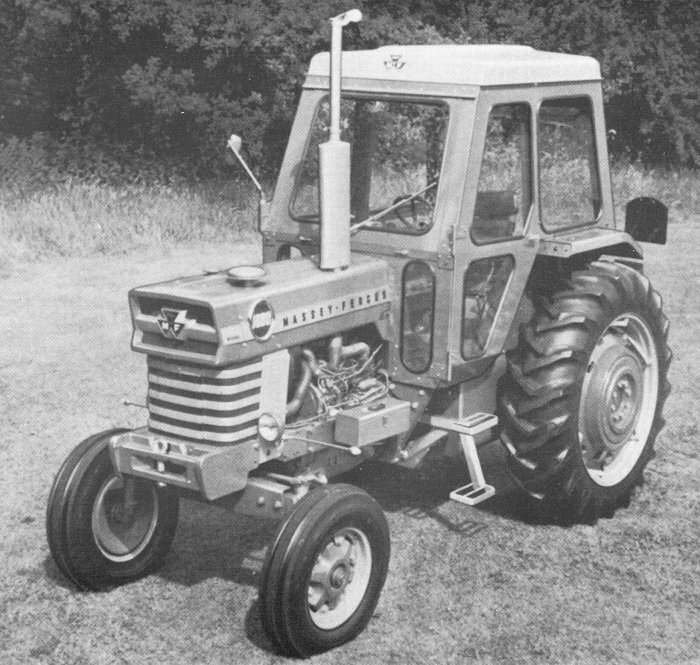 In 1969 a new model was introduced the MF-1080. 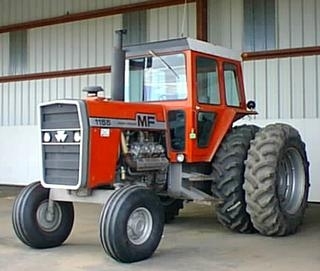 It was derived from the MF-180. 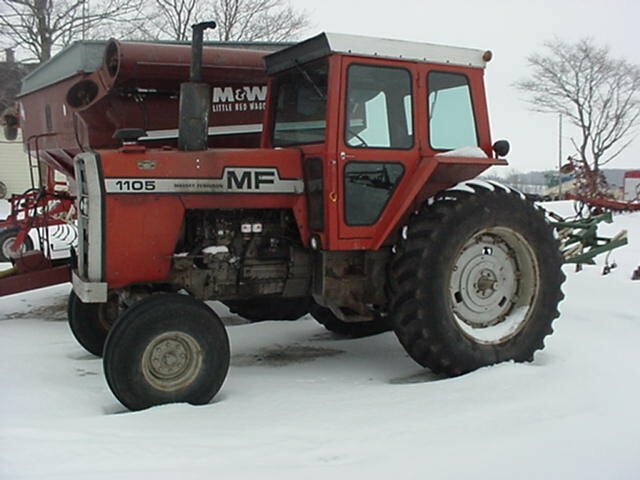 The MF-1080 was powered bye a Perkins 5209ccm diesel engine producing 81 PTO horse power (95 at the crank case). 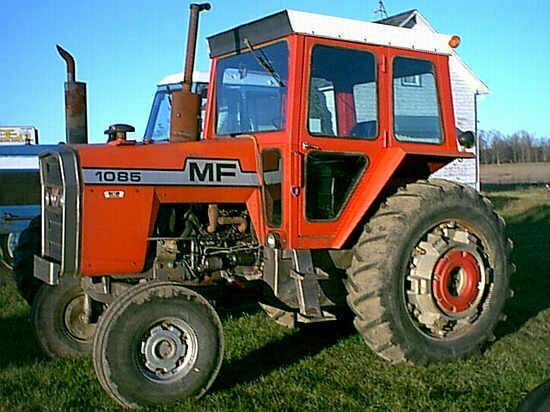 It was replaced with the MF-1085 in 1973. Next step in the DX 1000 line was MF-1100 and MF-1130, both were completely new designs. 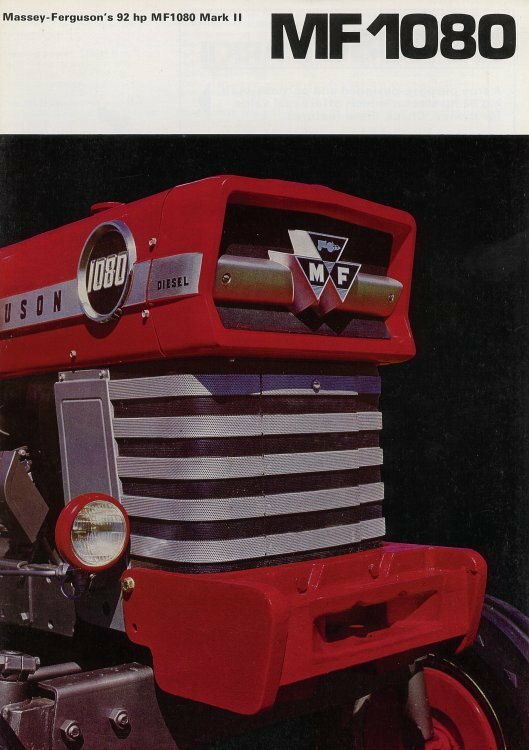 They were produced from 1965 onwards. 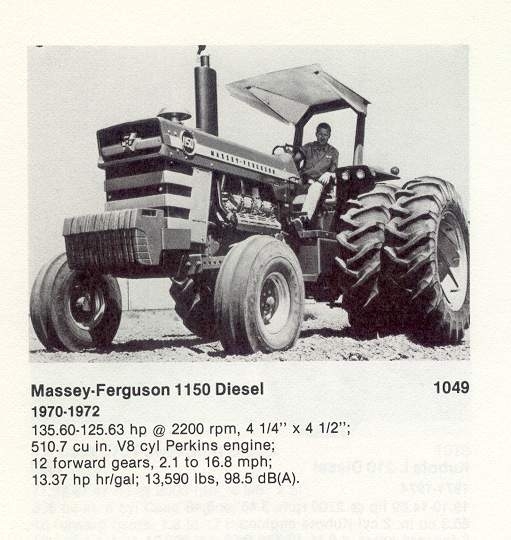 the MF-1100 had a six-cylinder Perkins engine of 5807ccm producing 110 hp at the crank. 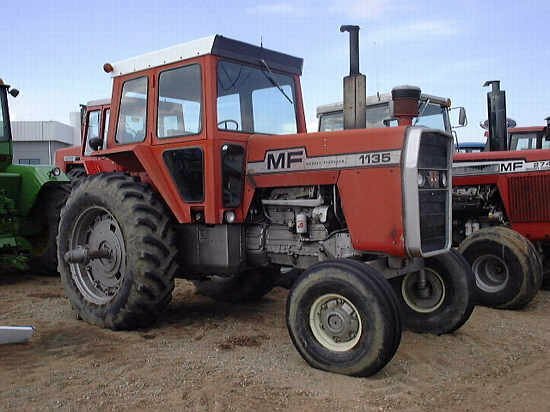 The MF-1130 had the same engine with a turbo charger, producing around 130 hp. 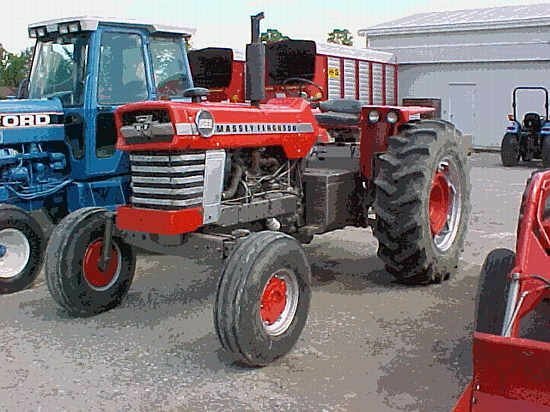 They were replaced in 1973 bye the MF-1105 and MF-1135. (se below). 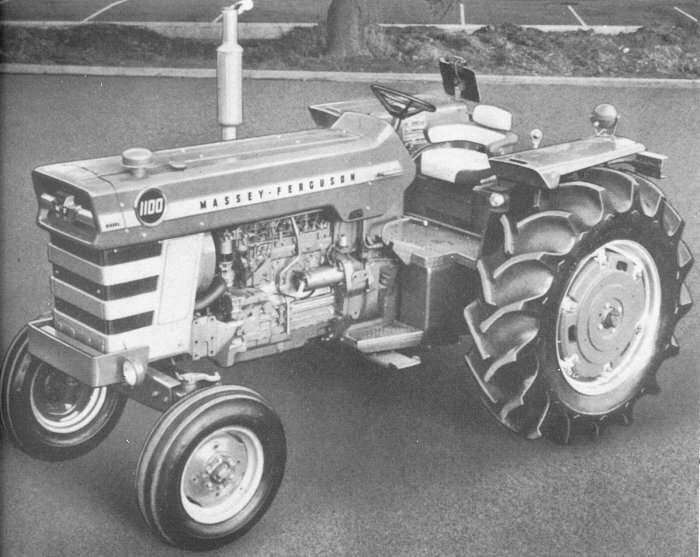 V-8 power, from 1970 the MF-1150 with a Perkins V8 engine of 8365ccm producing around 146 hp at the crank. 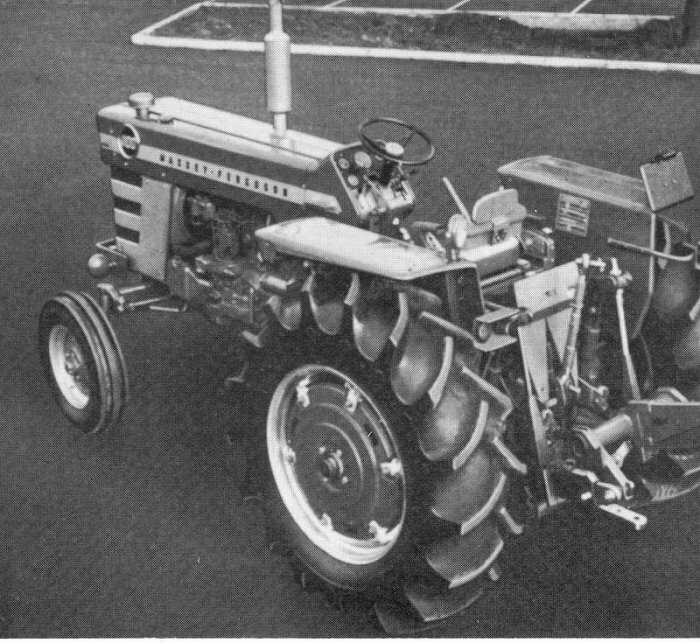 It was replaced in 1973 by the new MF-1155. 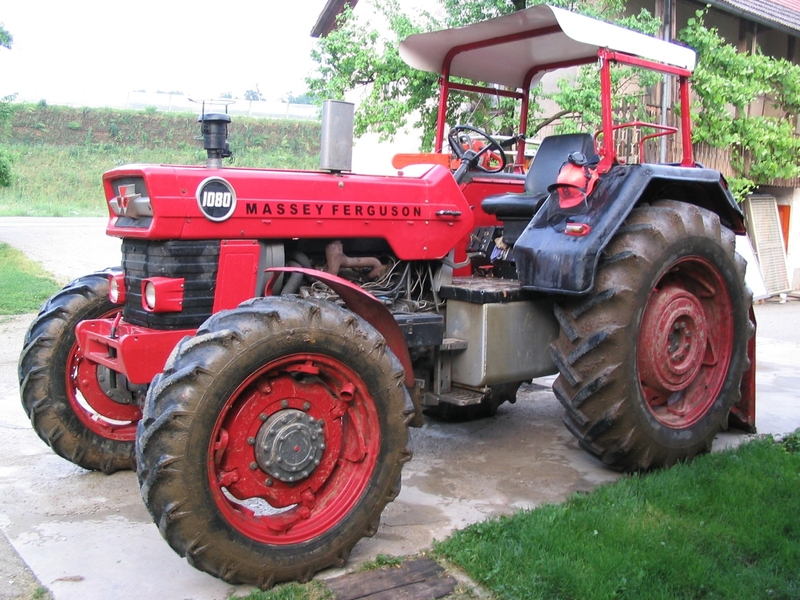 The latest version of this tractor (1105, 1135 & 1155) adopted the style of the new MF-200 series. 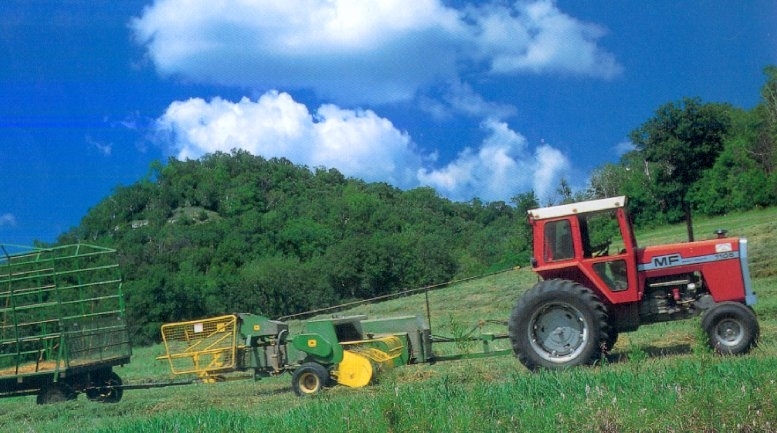 Unlike the 100 series the 1000 tractors adopted radial hydraulics pumps. 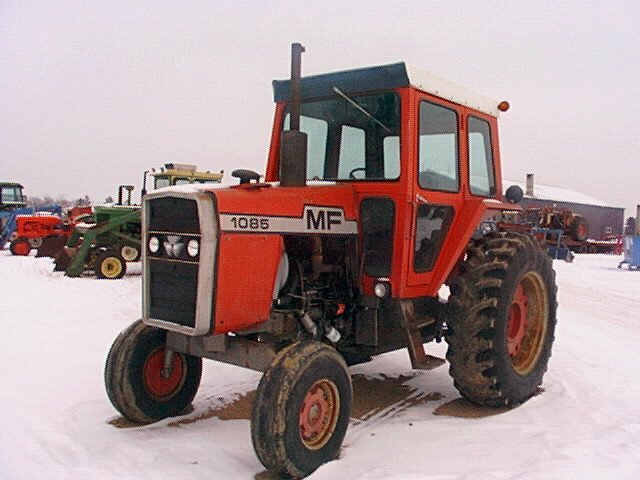 The MF-1085 replaced the MF-1080 in 1973. Built on the platform of the US MF295. 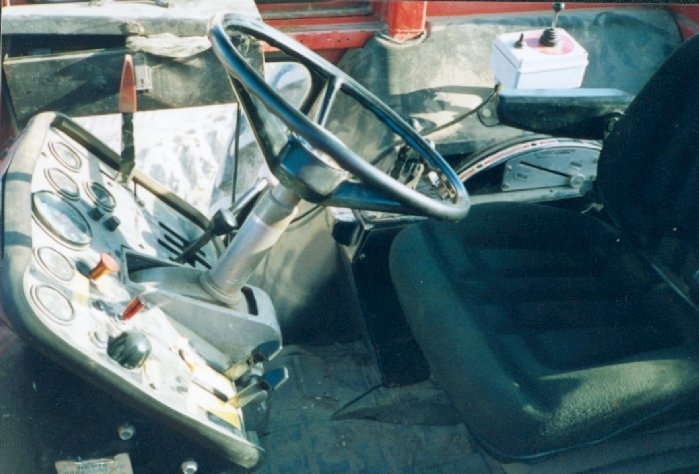 ** This incorporated a new design more like the MF-500 series which was to follow in a few years. 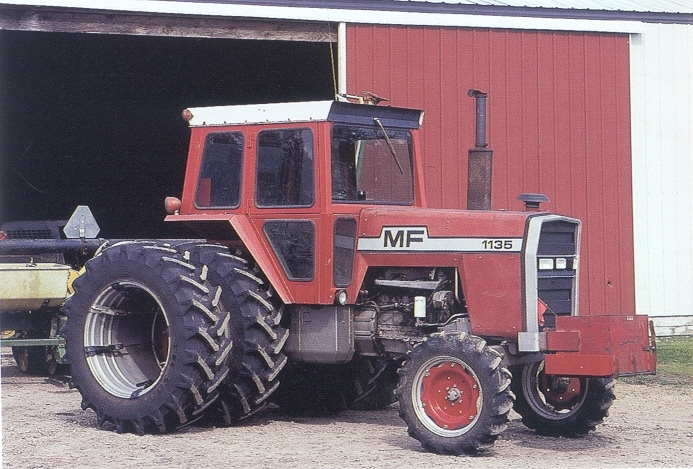 The MF-1080 and -1085 was available with either a standard or adjustable wide front axle. 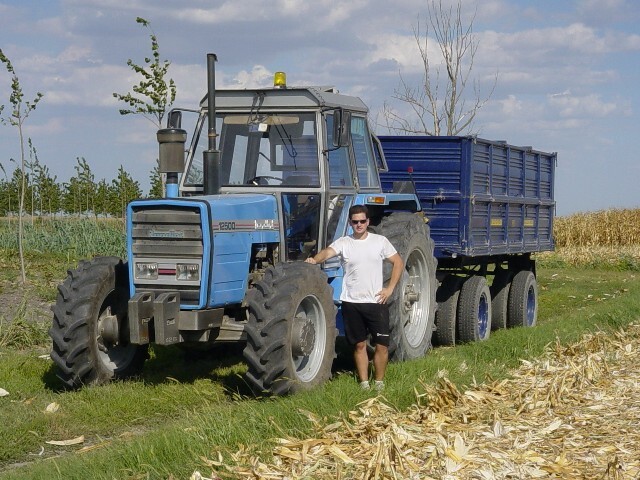 A newer 1085 w/cab. 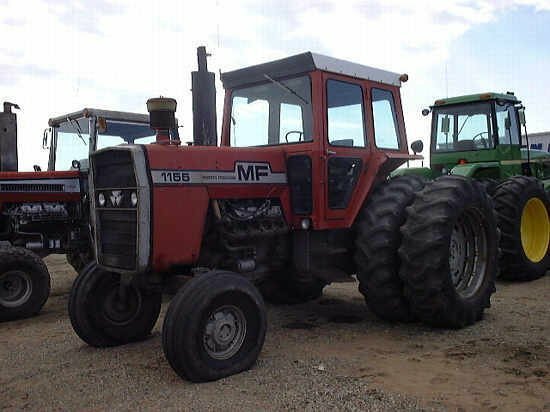 1977 1085 w/cab A newer 1085 A newer 1085 w/cab. 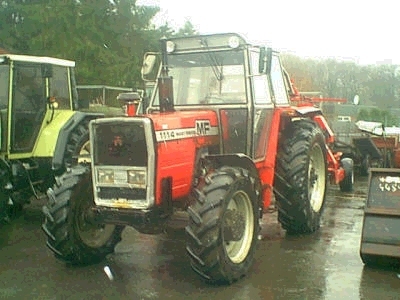 *) the MF-1085 was sold on different markets as the MF-595 or -285 (the 285 without cab). 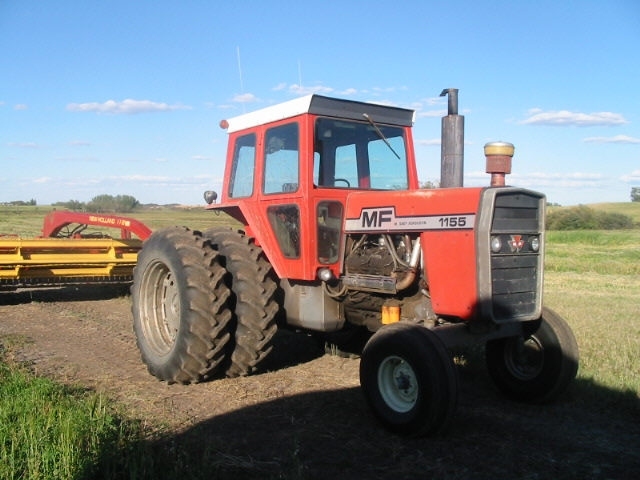 The MF-1085 was an updated MF-1080 produced from 1973 on the Canadian plant mainly for the North American market, it looks similar to the newer 500 range. **) Thanks to Pudding for the correction. * Multi Power **) not sure about this! 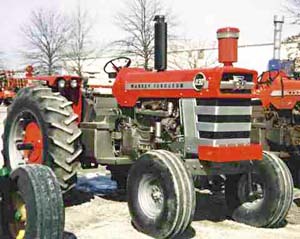 The MF-1100 was produced from 1965-72. 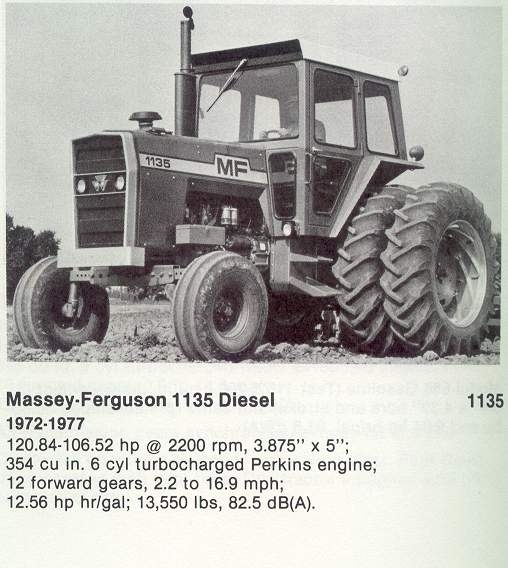 It had a Perkins A6.354 six cylinder diesel engine. 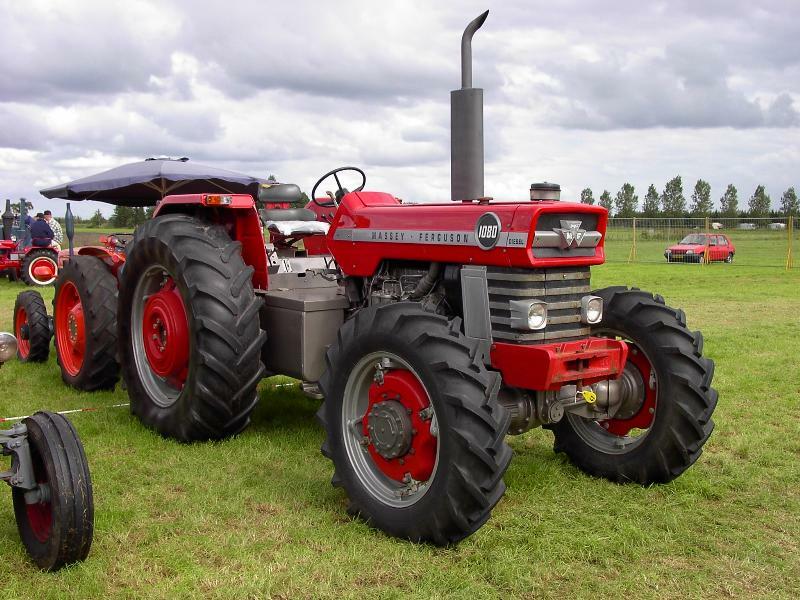 From 1967 the MF-1100 was available with a Waukesha F320-g six cylinder petrol engine. 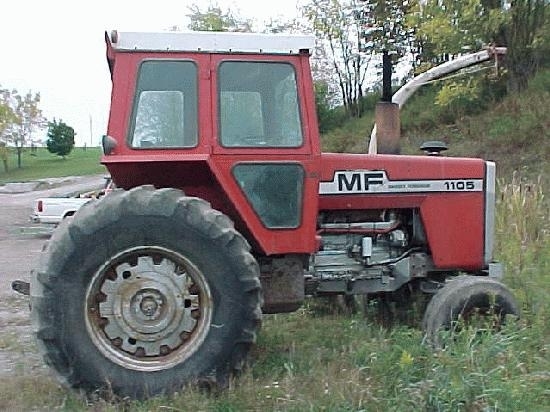 The MF-1105 replaced the MF-1100 in 1973, a turbo charger was added to boos the power to around 125hp. 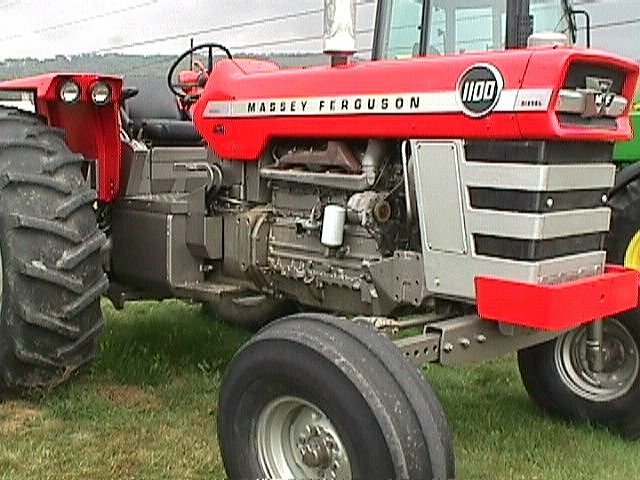 The design was similar to the MF-1085. 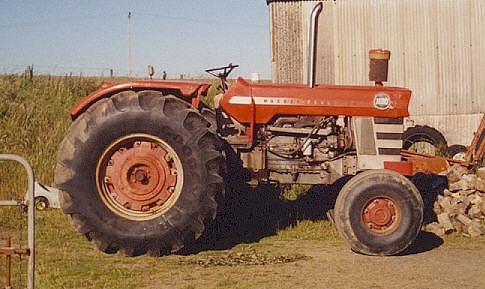 The MF-1105 produced on the Canadian plant mainly for the North American market. 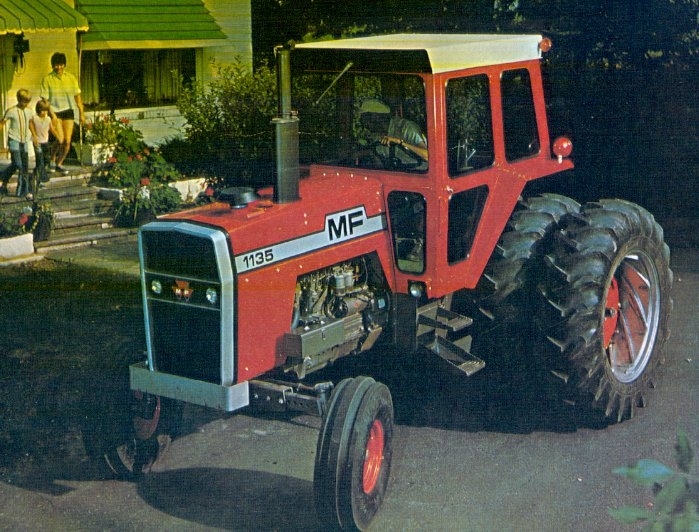 Another story: The MF-1105 was replaced in 1977 by the MF-2675. MF1100 petrol & Lp gas. 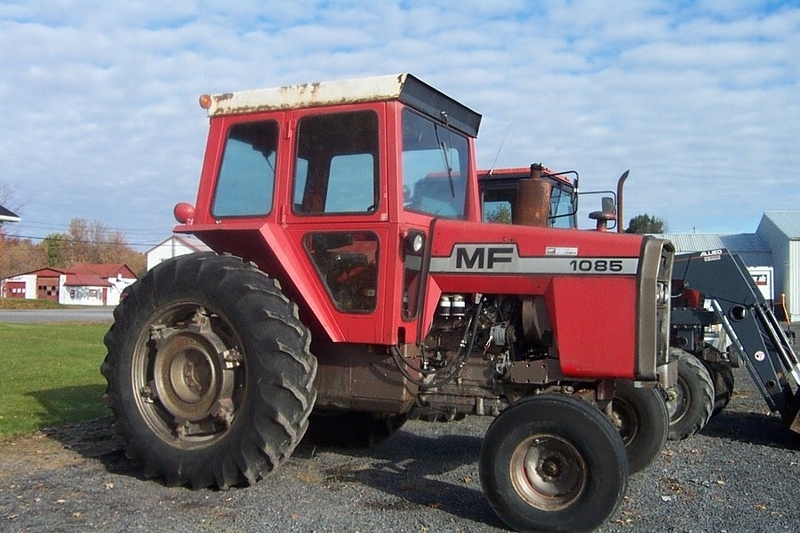 Further development from the MF-1100-1105 was the MF-1104. 1114 and 1134. 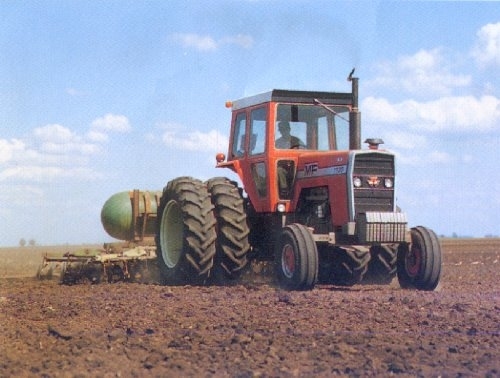 A MF-1114 from 1978 in the picture at the left. 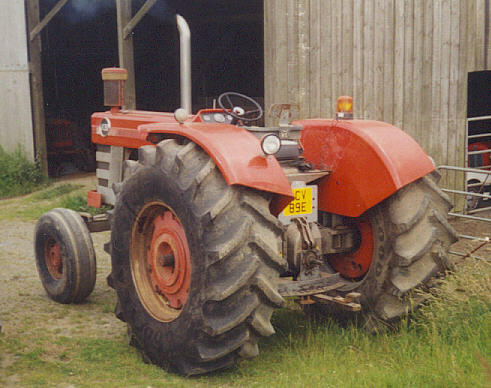 It had a Perkins A.6354.4 diesel engine with 110hp. 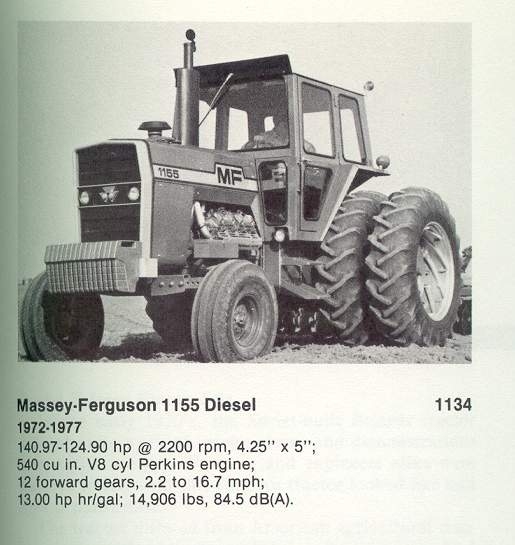 and was in production from 1978-1981. Looking much like the MF 595. Type Engine Power HP. Year made. 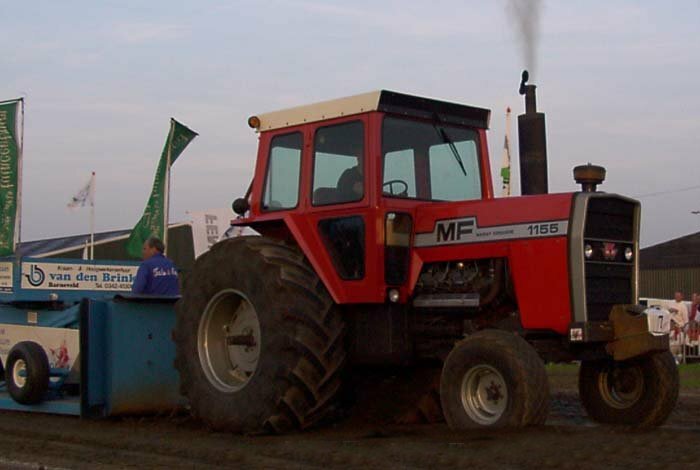 The MF-1130 was the strongest MF tractor in Europe with its six cylinder Perkins AT6.354 Turbo diesel engine. 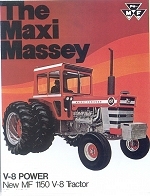 It was produced from 1965 till 1972. 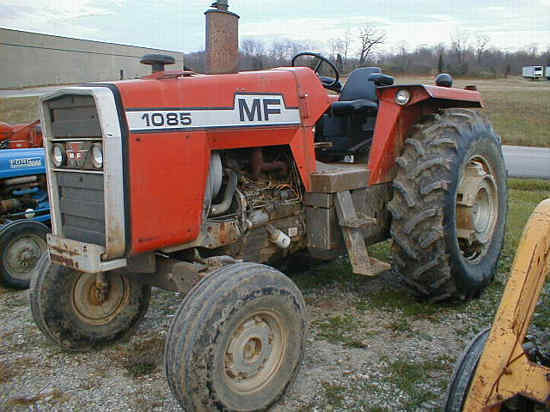 It's a MF-1100 with a Turbocharger. 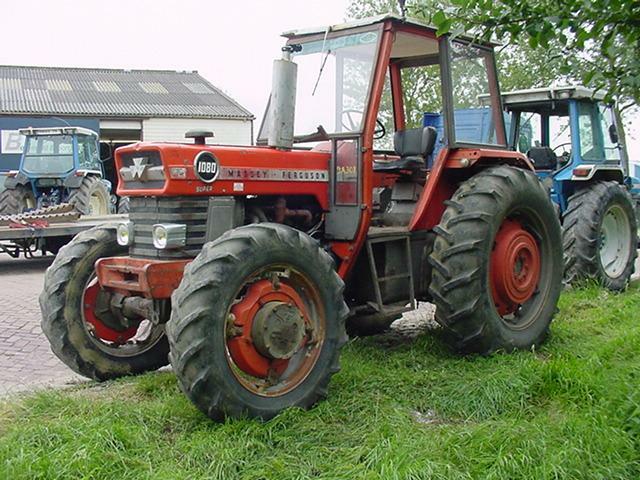 It was replaced with the MF-1135 in 1973 the power was raised to around 140hp..
A 1135 advertising. A 1135 advertising. A 1135 big picture! 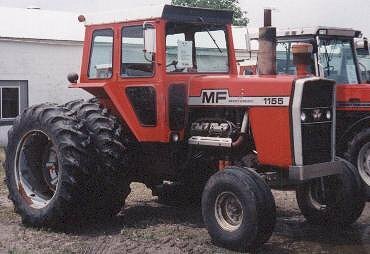 Another story: The MF-1135 was replaced in 1977 by the MF-2705. Power: SAE 136 hp** 2200rpm. Power: DIN 140 hp 2200rpm. 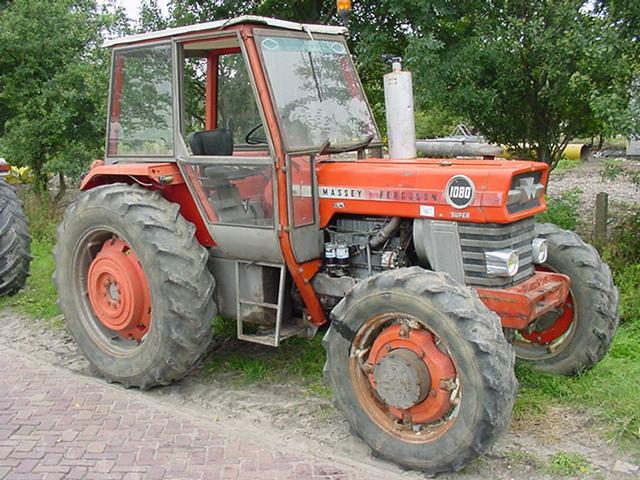 Power: DIN 140 hp 2200 rpm. 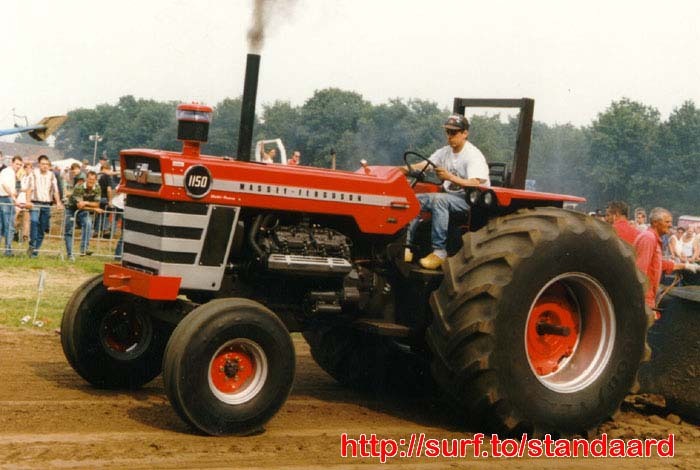 The biggest MF tractor at that time was the V8 diesel MF-1150. 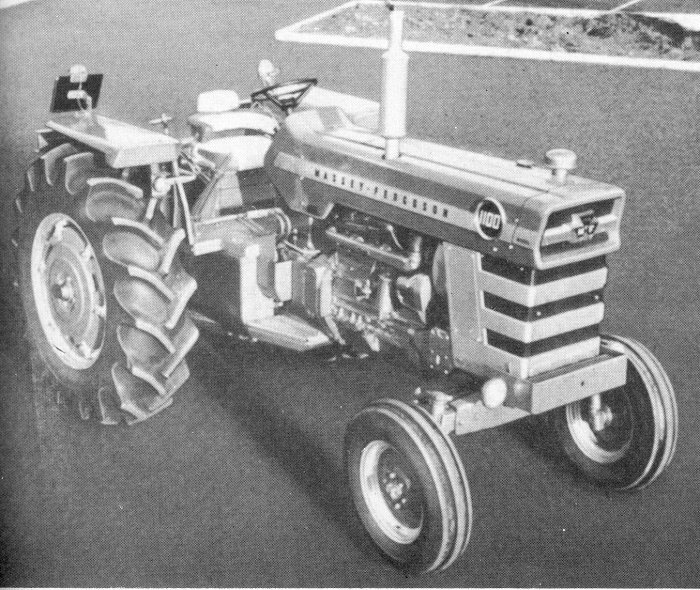 It had a Perkins V8.510 engine. 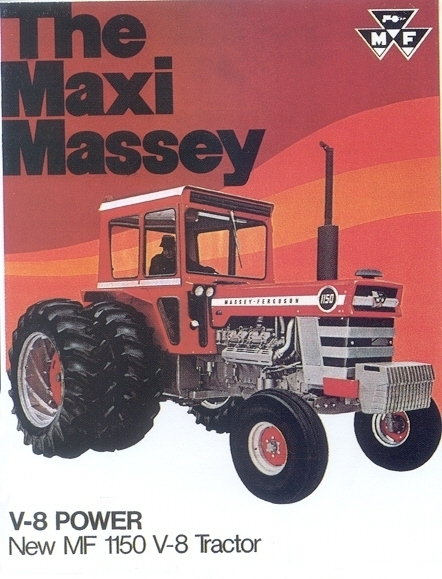 It was only produced from 1970 to 72. 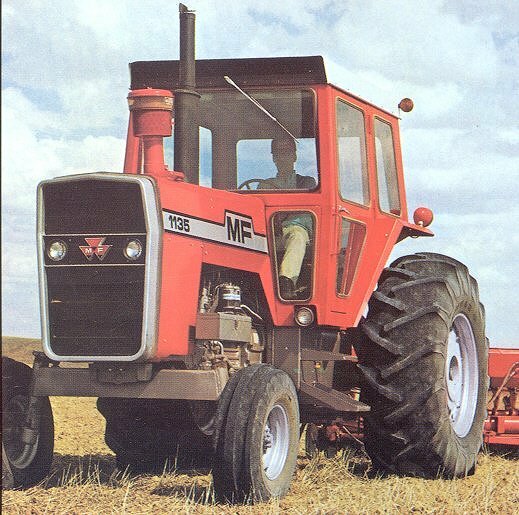 It was followed bye the MF-1155 in 1973. 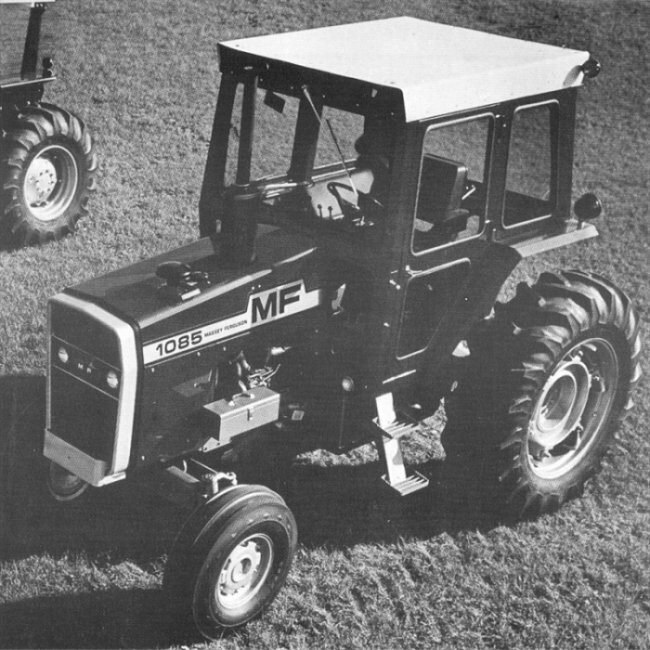 As all updated models from 1973 they had the new design of the soon to come MF-500 series. 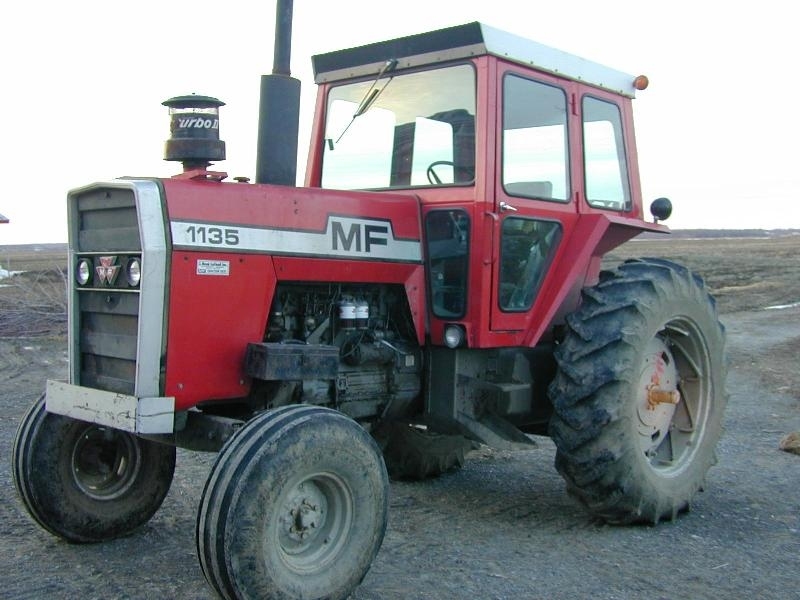 The MF-1135 & -1155 produced from 1973 on the Canadian plant mainly for the North American market. 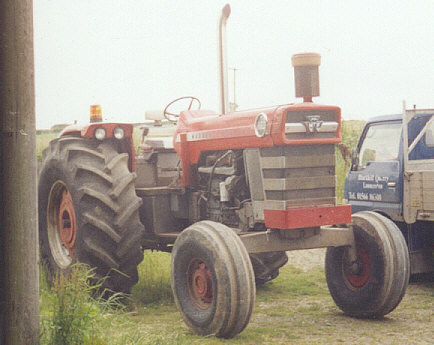 A 1155 used for tractor pulling. 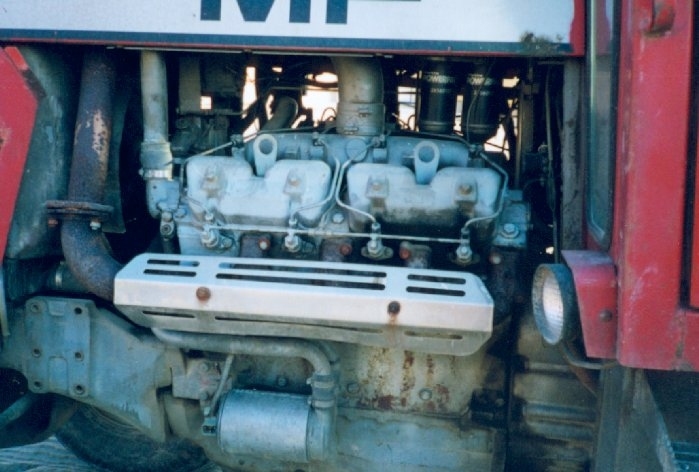 A 1155 engine details A 1155 cab. 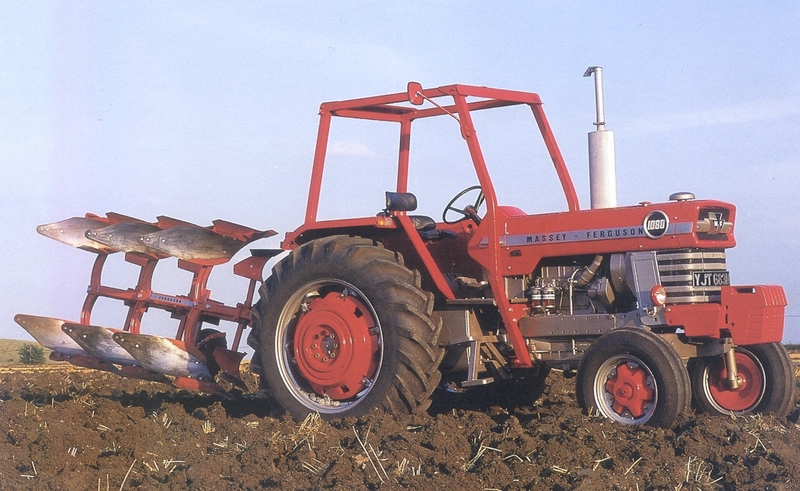 *) the MF-1150 was available with Western type non-adjustable front axle or Row-Crop wide adjustable axle. 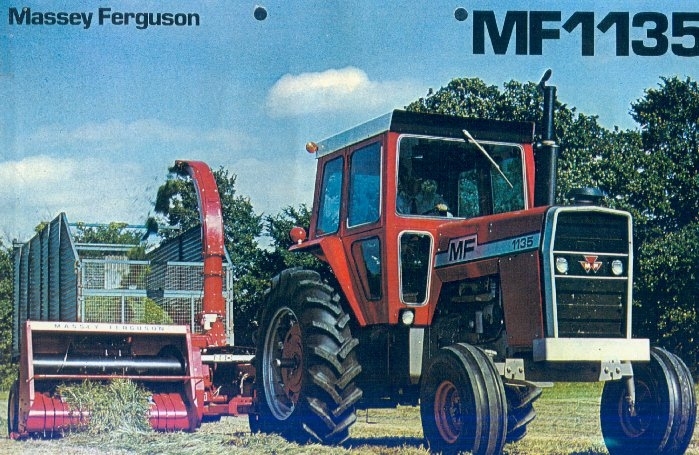 Another story: The MF-1155 was replaced by the MF-2745, same year.